Shortly after posting my review of Luca Serianni's "Prima lezione di grammatica", I received a message asking whether I would like to get a copy of a new grammar self-help book: Dianna Booher's "Booher's Rules of Business Grammar: 101 Fast and Easy Ways to Correct the Most Common Errors". I said I was interested; a few days later I received the book. After several weeks, here is my review. I admit I have not read the book from the first to the last page, but only looked at the issues that most interested me. I believe it is designed to be skimmed until you find one or more sections that deal with your linguistic doubts. The books briefly explains the underlying grammar, suggests the correct way to write something, says what is wrong with the alternatives, and provides mnemonic help to remember the correct solution for each error. The target audience is not clear: some of the errors corrected are the kind that normally only native speakers of English make (such as the contraction "it's" wrongly used for the possessive "its": a blunder sometimes committed by native speakers but which I have never seen in the writing of educated foreigners). Other errors only foreigners - without an instinctive ear for English as their native tongue - would make (such as "They had went to the office earlier in the day"). May means that things are possible, even likely. Might means that there's less likelihood of something happening. [...] Might is also the past tense of may. In those situations, the degree of possibility is not the criterion for using might. If the other verbs in the sentence are past tense, may becomes might (past tense). Link the may-might dilemma to Dusty Springfield's hit ["just wishin' and hopin'"], and you'll be humming the criterion for choosing the correct word: What's the likelihood? May implies that things are more likely than might does. Not useful to those who don't know Dusty Springfield is or was, and have no idea what's the tune we are supposed to be humming to remember the mnemonic by. "Has lied", is not a present participle, but a present perfect. An example with a present participle could have been "Mortimer told the truth yesterday, but he is lying now". The lack of parallelism in the examples ends up confusing the issue: "lie" in the sense of "to tell a falsehood" has examples for the present tense, the past, the present perfect (wrongly called present participle), and the past participle, but no example for the present participle; in the sense of "to recline" it has examples for the present tense, the past, the present participle, and the past participle, but no example for the present perfect. A few lines further on, "laid" is also called the present participle of the verb "to lay" ("They have laid walkways around the building this week"). Again, "have laid" is not the present participle, but the present perfect. The book is inexpensive (the cover price is $ 16.95), and could be useful for foreigners (for example professionals) who need to write English as their second or third language. For translators whose native tongue is English the book will probably be of little help, since they should already know their own tongue much better than this. 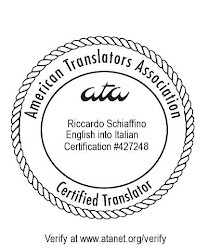 I also think it won't be very useful for translators who habitually write in English, even when English is not their native tongue, if they have a good grounding in English grammar. Many of the mnemonics will be useful for part of the book's audience (at least for the readers who rely more on aural than on visual memory). In the companion web site you can answer 25 questions to "test your grammar IQ". It's a nice touch, and can help you see whether reading the book has helped you any (by taking the test before and after). The test gives a score but it does not suggest which answers were wrong, nor what the correct answers should have been. I think this omission should be corrected in a way that could entice more readers: something like "you answered x to question 24, but the correct answer is y. To see why this is the correct answer and x was wrong, and to find more help for your linguistic doubts, please see our book". To sum up: a book that may be helpful to some, especially to foreigners writing in English, but not to most translators. Funny you are doing this review today as I have been looking around to find out what grammar book do native English translators use. So, in fact, what is(are) the grammar book(s) you would recommend? The one grammar I always use, however, is "A Communicative Grammar of English", by Geoffrey Leech and Jan Svartvik (Longman, 3rd ed., 2003). Leech and Svartvik are two of the co-authors of the Comprehensive Grammar of the English language. This is a much shorter book. It is aimed at advanced learners of English as a second language (English is not my native tongue, after all), but i believe it would be very useful to English native speakers as well. Bear in mind: these are detailed descriptive reference grammars (in the case of the first two, in fact, very detailed). Definitely not the same kind of books as prescriptive guides to improve one's usage. Other errors only foreigners - without an instinctive ear for English as their native tongue - would make (such as "They had went to the office earlier in the day"). I have to disagree here Riccardo. Maybe it is really not your kind of show, but watch Judge Judy and you will hear native speakers say I had went, I had brung, I had tooken. OK, I stand corrected then. Must be that I'm invariably an optimist. Or that you don't watch Judge Judy!